It has been 18 years and 110 days since the city’s pledge to build the West Branch Library. The Glendale city council workshop of April 5, 2016 had 3 major issues up for discussion and direction by city council: the temporary West Branch Library; the pavement management program; and an introduction to the proposed new city owned arena manager. Since I brought up parking for Heroes Park in my blog of April 5, 2016 entitled Glendale…fix the parking problem you created, it was definitely a topic of discussion. Erik Strunk, Director of Parks and Libraries, stated that they are working on temporary parking. He did not address the issue of Park Rangers sending people to park in adjacent neighborhoods or the safety issue of people crossing Bethany Home Road or 83rd Avenue to get to the park. The final direction of the city council was to move forward with a temporary, 7500 square foot modular building. This action, of course, removes all impetus to ever build a permanent library structure. So, we in west Glendale, once again, get less — a 7500 SF modular structure half the size of Velma Teague Library in downtown Glendale. The second item for discussion and direction was the city’s pavement management program. Currently the city spends $10 million annually to repair and maintain the city’s streets. Staff requested an additional $5 million a year. Ms. Vicki Rios, Interim Finance Director, presented a series of slides during the discussion. I bring two of those slides to your attention. This first one shows the city’s current debt service. The red, dotted line is the city’s secondary property tax revenue that is used to pay this form of debt. Please note that as of this year’s (FY 16-17) budget there is new debt capacity available…perhaps to build the west branch library? The new debt capacity is the difference between the red, dotted line and the sold green block depicting debt payments. Not so fast. Look at this second slide. It depicts current debt plus new, proposed debt. Note the Series 2016 debt depicted by the brownish square in the legend. That Series 16 debt is the $32 million the city is issuing next week to pay for the land and to construct parking on it to satisfy the city’s obligation to provide adequate parking for Cardinals’ football games. The orange, olive and blue areas above the brownish parking debt represent $5 million dollars a year in new debt for the pavement management plan. Note the red, dotted line which are funds used to pay the debt. Now there is no debt capacity available until Fiscal Year 21-22. With council’s approval of two items: the issuance of $32 million in debt for Cardinals’ parking and the $5million a year ($15 million total) for the pavement management plan there is no debt capacity to do anything else including building a permanent west branch library. The significance of these decisions is that there will be no debt capacity to build a west branch library for SIX more years until Fiscal Year 21-22. We will have waited for the west branch library for 25 years. There is no word to describe this situation other than disgraceful. The last item was a public introduction of AEG as the proposed new manager of the city owned Gila River Arena. There was no mention of the Coyotes who continue to declare that they will move to some magical, undefined new facility somewhere else in the Valley. The reality is that AEG, as arena manager, the Coyotes and the city will have to come to terms in the meantime. I continue to believe if the Coyotes and AEG can come to agreement for a few years, why not long-term? Under council requests for future workshops only one councilmember spoke, Sammy Chavira. He requested that the city present its travel policy and compare it to other Valley cities. What was more interesting is that Sammy, largely invisible these days, was cornered by an Arizona Republic reporter and questioned about his trips. Sammy’s only response was, “I want to stick to the policy to find out from now on – so next time, if you look at your policy, if you see anything, that you know that’s what we’re adhering to. What I want to do is I want to put something in concrete.” Say what? What did he say? Here is the link to the full story in the Arizona Republic: http://www.azcentral.com/story/news/local/glendale/2016/04/06/glendale-councilman-sammy-chavira-requests-review-travel-policy-after-council-trip/82631826/ . I can see it now. Sammy’s defense is that he followed city policy. OK, so now it’s the city’s fault? Where is Sammy’s ethical and moral compass? In essence he is admitting that he took advantage of a policy. It’s the same as if there were a policy that said, thou shall not steal. Since the policy is so vague an argument could be there is no definition of the word “steal.” Sammy is playing word games but they won’t work this time. He is accountable for his actions. He should voluntarily reimburse the city for the nearly $25,000 he spent for trips to see the Pope, his buddy sworn into Congress, his excessive baggage claims and rebooked flights, and his two highly suspicious trips to California. Don’t hold your breath on this one. This is the last blog in a six part series about Glendale’s debt. In previous blogs we explored the different kinds of debt, how those debts are paid and the purposes for which each debt was created. Some debt such as Enterprise Fund debt, Highway User Revenue Fund (HURF) debt, Transportation debt and a portion of the General Obligation (G.O.) debt are reasonable debt. A portion of the G.O debt could be characterized as imprudent and unnecessary debt. The Municipal Property Corporation debt, in hindsight, is unnecessary debt created to fulfill the commonly held vision of former Mayor Scruggs and former City Manager Beasley. The purpose of this exercise is to manage Glendale’s debt by paying it down or eliminating portions of it. Very simply the city’s expenses are greater than its revenues. The result has been to strip the city bare and reduce services to its residents (such as reduced library days and hours) because the debt is absorbing revenues that could be used for other purposes. When a mistake is made it is better to accept accountability, rectify it and move on. A city is required to do the same. A simple example might be that you decide you want a new car. You don’t need a new car. The old one is fine but you have decided you must have a new car. You buy a Tesla (extravagantly expensive) just because you want it. However, to make the payments you cut back on food, utility expenses and other necessities. You end up eating beans and rice every day, live without air conditioning and stop using doctors but, by God, you have the car of your dreams. You may be comfortable with your decision but the rest of your family may not be so happy especially if they are not allowed to weigh in on its purchase. One day your child is ill and the family learns that you stopped making medical insurance payments. If it is a decision that affects only you, fine, but it’s not right to obfuscate when that decision affects others without their buy-in. In Glendale’s case it is the residents of the city many of whom are not fine with past decisions that incurred tremendous debt and have resulted in a diminishment of their services. By September of 2003, former City Manager Dr. Martin Vanacour had resigned (that’s a whole ‘nuther story) and Ed Beasley had been appointed by City Council. Make no mistake, Fiscal Year 2003 was Vanacour’s budget and Beasley never attributed its success to Dr. Vanacour’s management. I hope Dr. Vanacour will not take offense if I refer to him as Marty. I respected and admired Marty a great deal. He was and still is, highly respected by his peers. Marty was an excellent city manager and was also fiscally conservative. I genuinely liked Marty. He was approachable and respected confidences. Sometimes he reminded me of a Buddha or sphinx as he would sit stoically, listening to my latest series of questions, comments or rants. There were a few, alas an important few, who wanted new management. They wanted someone who would lead Glendale into becoming the “new” Glendale acknowledged by all as THE Sports and Entertainment city. That someone chosen to be the new City Manager was Ed Beasley. Between 2003 and 2009, on former Mayor Scruggs’ and former City Manager Beasley’s watch all of the current MPC debt was incurred. The MPC debt is killing Glendale financially. This debt is paid out of Glendale’s General Fund because MPC debt is paid from sales taxes. Sales tax monies are received and accounted for within the General Fund. It should be the prime imperative for the city council to reduce or remove MPC debt by any means possible as quickly as possible. The elimination of MPC debt frees up General Fund money for other purposes such as restoration of library hours or other basic services Glendale provides to its residents. What does Glendale do now? It must use a combination of strategies that will bring Glendale’s expenses in line with its revenues eliminating the need to extend the temporary sales tax increase beyond its 2017 sunset date. 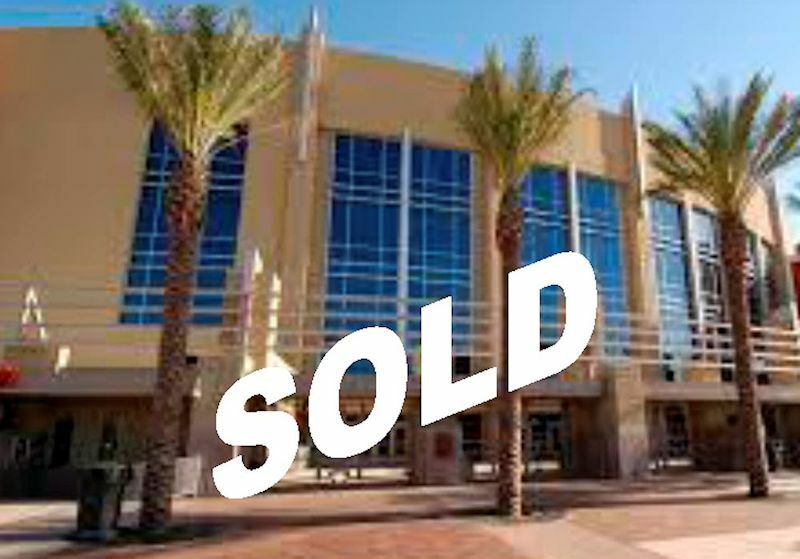 STRATEGY #1: Implementation of the sale of Glendale’s assets. I am pleased to see that Glendale staff has finally drawn up such a list and presented it to council at the workshop on May 20, 2014. Staff acknowledged that they omitted the two city owned golf courses: Desert Mirage and Glen Lakes and that they belong on the list. Here is a link to Glendale’s current assets: http://www.glendaleaz.com/Clerk/agendasandminutes/Workshops/Agendas/052014-W02.pdf. Executive Director of Finance, Tom Duensing, said recently, “Selling city property is just ‘one-time money’.” I beg to differ. Not in all cases. If a city facility’s O&M is being subsidized by General Fund revenues or if it still has construction debt then the city gains in two ways. It brings in much needed one-time cash that can be used to pay down or off the construction debt but it also eliminates an on-going General Fund expense. A case in point is the Civic Center. The Civic Center was built as Pay-As-You-Go with cash from the General Fund. It has no construction debt. Did you know that since it opened the city has subsidized its operation and maintenance in some form or fashion? There was even a period of years when all city departments were required to hold all of their events at the Civic Center. It was a way to subsidize the Civic Center without being readily transparent since department event expenses are a line item in a department’s budget and there is no explanation regarding those payments. No matter what is suggested as an asset to be sold someone’s ox will be gored. There are so many stakeholders each supports a different city asset. It will be a painful experience for everyone. However, there’s either a will to finally fix this problem or not. What should be sold? My list will be different from yours. I welcome all comments to this blog that argue for or against the sale of a particular asset. 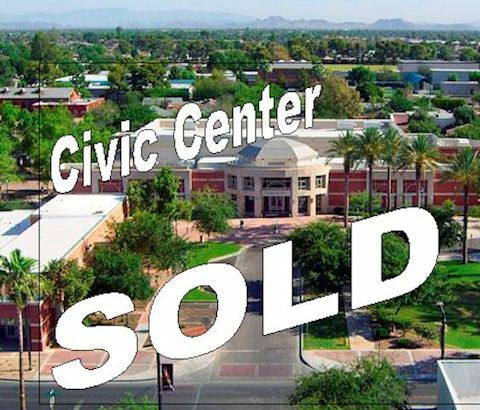 My list would include, but not be limited to, in the downtown area, the Civic Center, the downtown parking garage, the Bank of America building, the Sine building, the Thunderbird Lounge property, the Civic Center Annex, the St. Vincent De Paul property and the city court property. In north Glendale, I would sell the Foothills Recreation & Aquatic Center. In west Glendale the city should sell Jobing.com Arena, the Media Center and Parking garage, and the Convention Center. If a legal way can be found to sell Camelback Ranch, that would be on the list as well. STRATEGY #2: No employee raises until the General Fund has enough of a surplus to accommodate it. The current City Manager Brenda Fischer has complained that there is a 17% turnover rate of employees in Glendale but she never compared that figure to other Valley cities. In this economy people are thankful to have a job and we should know what vacancies currently exist, how many people apply and how long does it take to fill a vacancy? In other words, more information than the public has received to date. In police and fire there are always tons of people who apply. STRATEGY #3: While we are on the subject of vacancies, it should be standard practice to eliminate all unfilled vacancies each budget cycle. This is an accounting trick that has been used for years. It has always been a fist-fight to get staff to remove unfilled vacancies once and for all. STRATEGY #4: All departments would be required to live within their annual budget appropriation, with no exceptions. No more fire department requests for additional money to cover overtime. Council should require (not request yet another study that goes nowhere) the fire department to move immediately to implement 3 man staffing on trucks and to implement the use of small, 2 man vehicles to answer medical calls. STRATEGY #5: No carry-over requests from year to year with one exception. A project currently under construction but not completed within the year should be allowed carry-over to complete the project. If it is a project not yet begun it should have to compete for the appropriation the next fiscal year. STRATEGY #6: Each department’s “Professional & Contractual Expense” must only be used for specific essential expenses. Only a specialty’s required licensing and organization membership should be permitted. The city’s payment for publications should be eliminated. The city’s policy on car allowances and cell phone use should be reviewed and the usage monitored carefully monthly. STRATEGY #7: Council’s will to live within its means must be implemented as well. A majority of council possesses the prevalent attitude that it can approve new expenses and somehow the staff will find a way to cover them. From the last blog we now know more about Enterprise Fund debt than we ever really wanted to know. It is important to remember that it has a dedicated source of funding – customer utility bills. Its debt is not paid with sales tax revenue. Since it is separate fund it does not impact the city’s General Fund. It is safe to say that it is not the primary cause of Glendale’s financial problems. Let’s dig into the next pocket and see what we find. In Pocket #2 is the Highway User Revenue Fund (HURF) bond debt of $4,695,875 – 6% of Glendale’s total debt and Transportation bond debt of $7,331,080 — 8% of Glendale’s total debt. This is an easy one too. When Glendale builds new roads or maintains and repairs them it uses HURF bonds. They are used to finance the improvement, construction, reconstruction, acquisition of right-of-way or maintenance of streets and highways of the city including traffic control devices as well as bridges and noise walls. Two examples of its use can be seen in the Arrowhead area along the Loop 101. The sound walls adjacent to the Loop 101 and the pedestrian bridge that spans it were paid for with HURF. Where does the money come from to pay HURF bond debt? Every city in Arizona receives State Shared Revenue and one of the pieces of State Shared Revenue is HURF. For instance, when you fill up your gas tank, part of what you pay is a tax on a gallon of gasoline. It goes to the state. The state, in turn, gives back a small portion of that tax to cities based upon a specific formula. Glendale, as does every other city in the state, receives this money back as state shared revenue. Transportation bond money comes strictly from Glendale’s voter approved dedicated portion of the city’s sales tax. After voter approval of this dedicated sales tax the city created a long term transportation plan for the money’s use and it is monitored by a citizen oversight commission. It is specifically dedicated and can only be used for transportation related projects from street repair to installing new traffic lights. The revenue is used to build transportation projects including design, construction and right-of-way acquisitions, roadway widening, intersection improvements, transit stops, bicycle connections, park and ride lots and airport projects. The bike lanes and bus stops throughout Glendale were paid for from the transportation sales tax. We know where the money comes from for this pocket and when we take it out we know the narrow uses for this money. HURF money comes from state shared revenue and Transportation bond money comes from sales tax that can only be used for that purpose. Both of these funds can only be used for street and transportation projects. In the next blog we’ll explore Pocket #3. Unfortunately things will become murkier as we move from the realm of specifically dedicated uses for bond revenue to the more discretionary uses found in Pockets #3 and #4. Suppose you had a coat with many pockets…many, many pockets. You are allowed to put certain dollars into each pocket and you may spend, with restrictions, for only one specific thing from any one pocket. It would be complicated and problematical, eh? Well, the coat is Glendale’s budget and each pocket has a specific purpose and restrictions. Why bother to learn about Glendale’s debt? There is no doubt that Glendale’s debt burden is at the root of its financial mess. 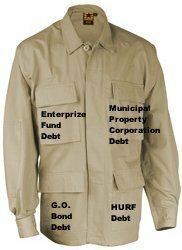 We’re going to look at the pockets that handle debt…all kinds of debt; Enterprise Fund debt, Highway User Revenue Fund (HURF) debt, Transportation Debt, General Obligation (G.O.) debt and Municipal Property Corporation (MPC) debt. All of the facts, figures and information came from public sources such as Glendale’s Budget Book for 2014 and other public, official Glendale documents. Let’s take the easier debt pockets first and get them out of the way. In Pocket #1 is Enterprise Fund Debt of $24,975,437 – 28% of Glendale’s total debt. Water & Sewer Bonds are 27% of the city’s total debt and Landfill debt is another 1%.Enterprise Funds are water, sewer, sanitation and landfill. The Enterprise Funds were established by ordinance in 1986. Here is a portion of the text from the Sanitation Ordinance 1451: “The purpose of the sanitation fund is to accumulate all revenues and earnings received for sanitation services, to accumulate all interest earnings thereon, pay all administrative, operational and maintenance expenses, direct or indirect, of same, and accumulate contingency funds as an operational fund reserve to the sanitation fund. The sanitation fund shall be a separate and protected fund, to be used for no other purpose than expenses associated with sanitation services.” The other funds reflect the same language in their enabling ordinances. Note that these funds are protected and not to be used for anything else. Enterprise Funds are accounted for in a manner similar to a private business. Enterprise funds are intended to be self-sufficient with all costs supported primarily by user fees. They are stand alone funds. Their revenue does not go into the city’s General Fund. What Glendale residents pay each month for city utility bills goes into these Enterprise Funds. When debt (in the form of bonds) are issued it is for infrastructure projects such as the new 91st Avenue Regional Wastewater Treatment Plant, the Cholla Water Treatment Plant, the replacement and repair of water lines throughout the city and treatment plant upgrades to meet new federal regulations. Landfill bonds will be used to close the south portion of the city landfill and to open up the north portion. This debt is issued based on revenues received from customers for service. In an emergency the city could use secondary property tax revenue but by habit and practice, it has never done so. We know where the money comes from for this pocket and when we take it out we know the narrow, restricted uses for this money. The next blog will look at Pocket #2, HURF and Transportation Bond debt. It’s an easy one as well. Understanding a city’s debt burden is as dry as dust but in order to arrive at solutions for dealing with Glendale’s debt, it needs to be understood. Once we get a handle on it, let’s see if there are any solutions to bring it under control. If Enterprise Fund debt is still unclear to you or you have a question related to it, please offer your question as a comment at the end of this blog. I will do my best to answer it. That way everyone will be able to see the question and answer.